At Christmastime the majority of the rooms in our house are hit by the season’s sparkle. As in most homes, our main Christmas focus is always in the living and dining room but little touches also appear throughout such as a potted Christmas tree in the kitchen, a Gingerbread Tin full of festive bath bombs in the bathroom and paper chains and mini trees in the kid’s rooms. It has come to my attention however that one room certainly lacked the Christmas spirit- our small, drab hallway. 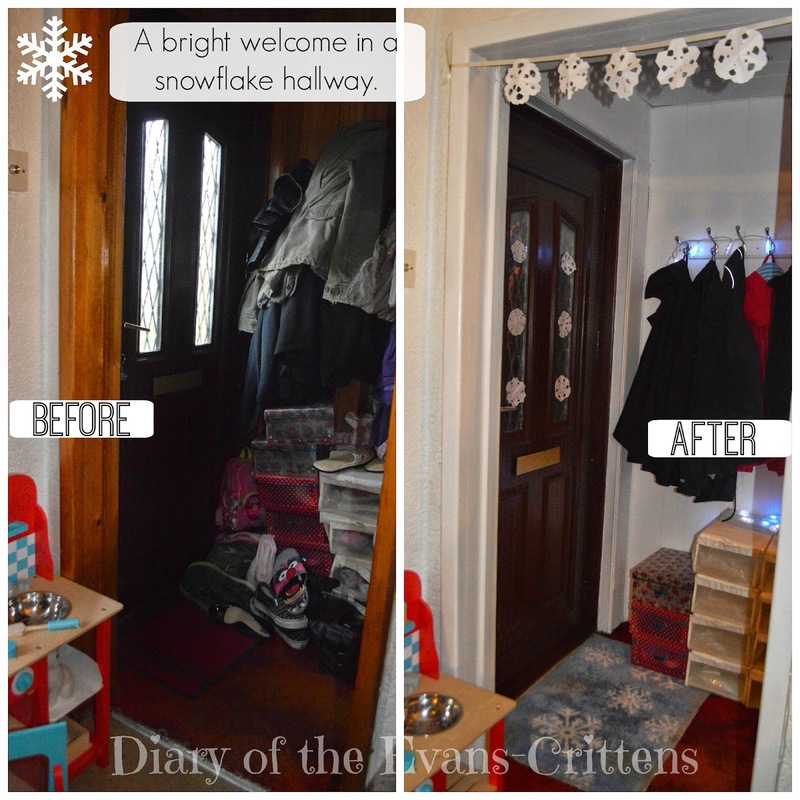 Although we mainly use our back door as our main entrance guests do still use the front door so I realised we really had to give our dark, little hallway a makeover- not just for Christmas. The first thing we do in every room before decorating is declutter. I sorted through the coats and put away our Summer season ones. I also sorted all our shoes. Most pairs are meant to live in the bedrooms and just the ones in daily use, such as school shoes, are to be be stored in the hallway but we’ve all been lazy of late and have left the hall bursting full of footwear. Next, we primed and painted our wood panelling white. I have been meaning to do this for years but have been quite scared in case it went wrong to be honest. I shouldn’t have worried as I love the new white panelling and it really lightens the space and makes it feel bigger. We also fixed the hall ceiling light. We were sent a Snowflake Christmas Turtle Mat to use to style our hall ready for Christmas, so I decided to make snowflakes the main theme of the room. We have paper snowflakes on the glass panes of our front door. Snowflakes LED Lights give a warm glow just above the coat hooks. A paper snowflake garland hangs across the door way. I confess that I am planning to hang a crochet snowflake garland here but I haven’t had an evening free to get my yarn out yet. Luckily, I love the simplicity of paper snowflakes anyway and the kids love making them with me. I did think about adding buttons or glitter but in the end decided to keep them crisp white. I love the patterns they make on the wall. I think the snowflakes tie the design together. I’m pleased to say that the Turtle Mat passed the vac test and can also be machine washed and tumble dried. Turtle Mats are developed to leave your floors as spotless as the last time you cleaned them, Turtle Mats’ super absorbent cotton tufts work hard to trap moisture and grab dirt so you don’t have to. This will come in very handy with these four kids and their muddy wellies! I haven’t completely finished decorating the hall. Now, the walls are white they seem taller so I am going to look out for a wooden sign or print to hang above the coats. I will also change the (lovely!) bright red carpet (hmm) at some point too. I am thinking about an umbrella holder in the corner and maybe a shelf above the coats for more display room, but for now I’m appreciating the look of extra space before I fill it all again! If you have any tips on decorating and organising a small hallway please let me know in the comments below. This is our entry into the Turtle Mat Christmas Mat Styling Competition. One lucky blogger will win a hamper for Christmas. We were sent a mat in order to take part. All opinions are honest and our own.